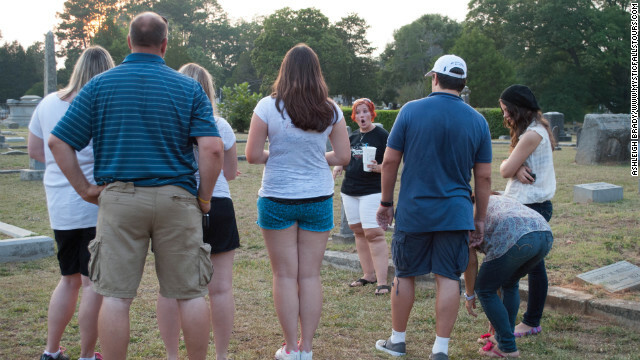 Mystic Falls Tours founder Jessica Lowery leads a group through the "Vampire Diaries" setting for the Mystic Falls Cemetery, located in Covington, Georgia. Editor's note: Emma Loggins is the editor of Fanbolt.com, an fan news site that specializes in behind-the-scenes information and interviews with the casts and crews of entertainment franchises with organized fan bases. Atlanta, Georgia is no stranger to the supernatural when it comes to film or television. AMC's hugely popular “The Walking Dead” and CW's “The Vampire Diaries” both film episodes around the city. With local fans stargazing at the (heavily makeuped) undead, it was just a matter of time before their geek out sessions turned into money-making business ventures. And that's exactly how several Atlanta-based tour companies were born.